I have always been curious about the wind. Where does it come from and where is it going? Why is it strong or weak? The explanation was probably covered in school but I’m sure I was absent that day. Warm air rises and cold air drops. The sun hits the earth at different angles. Straight sun rays at the equator are hot. Sun rays hit the polar ice caps at an angle and create little heat. When the earth circles the sun, it tilts toward the heat (summer) or away from the sun (winter). The Earth spins us toward the sun (day) and away from the sun (night). The meaning of all that? There is unequal heating across the planet. The Earth surfaces absorb heat differently, so the oceans, mountains, plains, lakes and forests are affected differently. Some areas are hotter than others. Warm air cools as it rises and the molecules are pressed tighter together. This is known as high pressure. Close to the surface, when the warm molecules rise they leave behind areas not packed with pressure (low pressure). These differences in pressure usually occur over massive geographical areas. 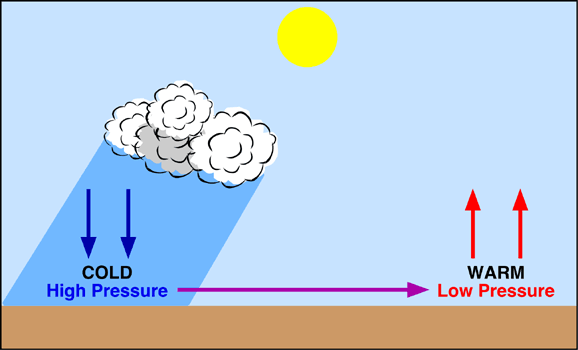 The simple summary: air moves from high pressure into low pressure voids. When hot air elevates, cooler air rushes to occupy the space. The movement of these air volumes is … wind. The bigger the differences in pressure, the faster the air moves. Are there better explanations than this? There better be. My third grade teacher in science class probably had a clearer message. Sorry I missed it.